Looking Up Rays Hill from Breezewood. 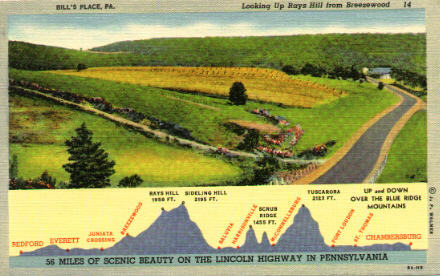 Card printed 1939, the year before the Pennsylvania Turnpike opened -- almost 30 years before the re-routing of the Turnpike changed Rays Hill forever by blasting away a good piece of the hill in order to bypass the tunnel which cut through the hill. 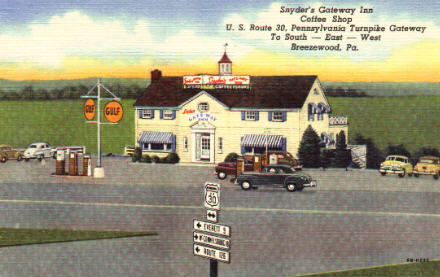 Snyder's Gateway Inn, Breezewood, PA. Hard to believe that this uncluttered view at the end of the Pennsylvania Turnpike ramp is really Breezewood. In 1924 Breezewood had 80 residents; now the Gateway Travel Plaza, successor to the Gateway Inn, employs about that many. 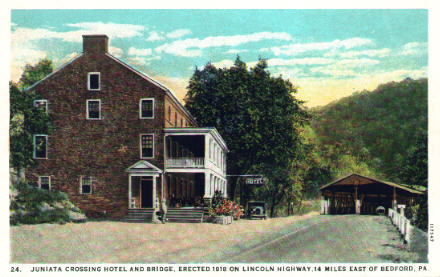 Juniata Crossings Hotel and Bridge, Erected 1818 on Lincoln Highway. The bridge was bypassed in 1934, then washed away in a 1936 flood. 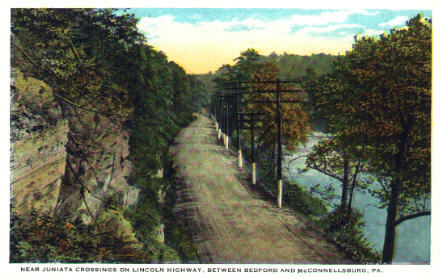 Near Juniata Crossings on Lincoln Highway, between Bedford and McConnellsburg, PA. Unfortunately, the subsequent reconstruction of the Lincoln took it away from the river. 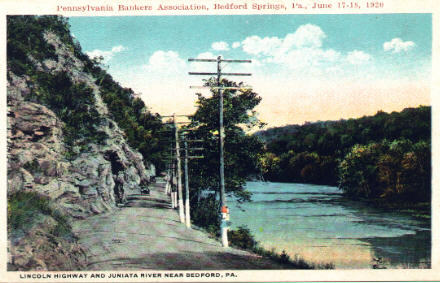 Lincoln Highway and Juniata River near Bedford, Pa. Card overprinted to commemorate a June 1920 convention of the Pennsylvania Bankers Association; note red, white and blue Lincoln Highway marker on first telegraph pole. 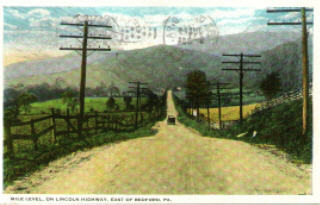 Mile Level, on Lincoln Highway, East of Bedford, Pa. Postmarked 1916; message on the back says that the sender "rode 55 miles over mts yesterday." 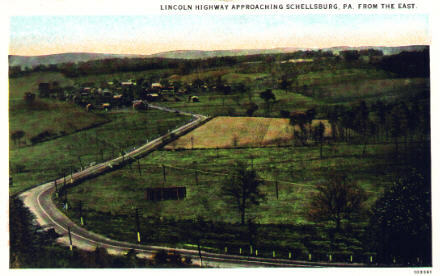 Lincoln Highway, Approaching Schellsburg, Pa. from the East. 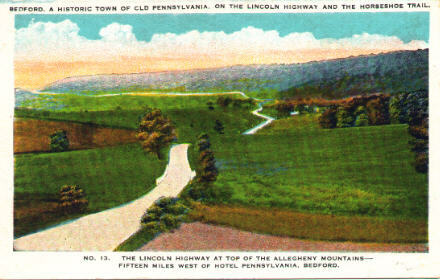 The Lincoln Highway at Top of the Allegheny Mountains, Fifteen Miles West of Hotel Pennsylvania, Bedford. 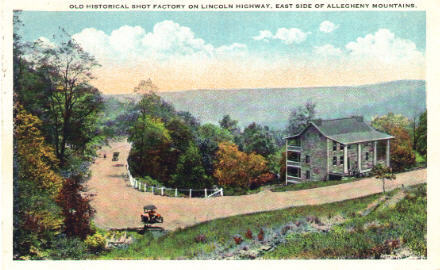 Old Historical Shot Factory on Lincoln Highway, East Side of Allegheny Mountains. The Shot Factory sits at the foot of the hill over which the Grand View Ship Hotel used to preside. 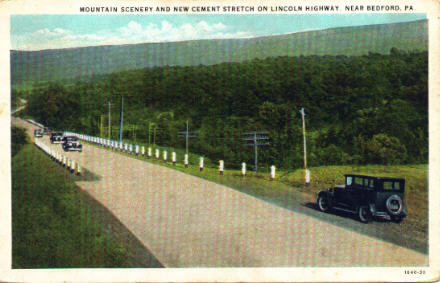 Continue on to read more about the Ship Hotel, greatest Lincoln Highway roadside attraction of them all.